April 1972 CHOPPERS. 2 CHOPPERS MAGAZINES July 1981 CHOPPERS. July 1981 CHOPPER. May 1980 CHOPPER. 2 CHOPPER MAGAZINES. 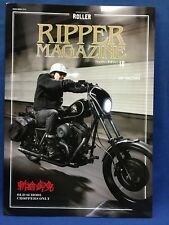 The Horse Backstreet Choppers Magazine Lot Issue #177 June & #178 July 2018 Bike. Condition is Like New. Shipped with USPS Priority Mail Flat Rate Envelope. Andy Anderson. Trump trees. White knights. Condition is Like New. 1978 Sturgis Coverage. 2003 Lot of 3 The Horse Back Street Choppers Magazine Jan Feb July. Condition is Good. Shipped with USPS Priority Mail. 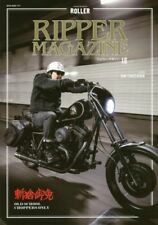 Show Class Chopper Magazine Vol. From smoke free house, Not perfect but very good. the horse backstreet choppers magazine # 34 Jesse JAMES 2003. Condition is Good. Shipped with USPS Priority Mail. Air Force bike..20. As a bonus we are throwing in a free sticker too! The 25 J Bobber.. The Good, Bad &Not so Ugly..64. The Hot-rod Cycle-X Trike.81. NORCAL DIGGERS. CUSTOM BIKE AUGUST 1977. CONTENTS PAGE IN SECOND PHOTO. 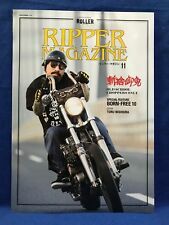 Dice Chopper Magazine Issue 43. Condition is Very Good. Shipped with USPS Media Mail. I have many back issues and will be listing more. Any multiple purchases (3 or more) will be upgraded to USPS Priority Mail. BIG BIKE SEPTEMBER 1970. CONTENTS PAGE IN SECOND PHOTO. 70's DRAG STRIP ACTION. CLASSIC CHOPPER PARTS ADS. Cover Model: Christine Walker. Model: Mallory Maneater. Tattoo Corner. This magazine is inVery Good condition, pages are clean, no stains, tears or folds. 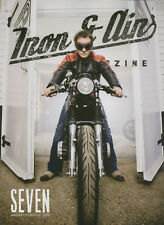 Cover: This pretty red machine is a one of a kind Triumph done up by General Motorcycle Engineering in North Hollywood, California, to demonstrate their expertise. Sigh over the rear disc brake. Gasp at the sensuous girder. Cover: David Alvarez's "Power to the Panheads" - una motocicleta por La Raza. 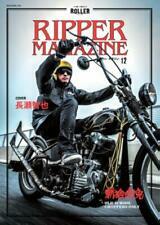 Cover: John Cogar on his 1937 knucklehead. I would grade this issue as in Very Good-Excellent (4.5/10) or better condition. It is an nice copy with just a small rectangle cut out of the front cover on the lower right hand side, other than that magazine is like new. That's a neat enough trick in itself, but when you add an E.M.E. girder and a peanut tank, you've got a conversion process which smacks of alchemy and witchcraft. They used to bury people under rocks for that in New England. , Chopper John Rides again and again and., Giveaway Chopper; Tech Things: Rake it Right! Cover: "A Classic Case" - This is a rare photo of Derek Davidson and his 74. The particulars are inside. ; Project Honda part 3; more. Cover: Sporty Spartan - two wheeled chariot from Needle Park - Steve Lahr's East Coast wonder is a Sportster with a different look. In short, the bike is the ultimate veteran. First was that while knuckles may be kneat, it's also a pain in the cylinder finding parts. Second thing was that there's an infinite amount of variation in knucklehead models. Third was the discovery that everything takes longer than it's supposed to. THE PICTURE IS A SCAN OF THE ACTUAL MAGAZINE YOU ARE PURCHASING IT IS COMPLETE AND IN LIKE NEW CONDITION. (SEE PHOTO) A GOOD SOLID MAGAZINE WITH NO LOOSE PAGES. CONTENTS PAGE IN SECOND PHOTO.